Sitting in a prestigious location within almost 12 acres of private grounds in the heart of the Suffolk countryside ten minutes from the coast, with commanding views, this three storey mid terraced self-catering holiday house is exceptionally spacious with an elegant open plan living space, three stylish bedrooms (two with en suites) and a family bathroom on the first and second floors. The front door opens into a welcoming hall with stairs leading to the 1st floor and doors to the cloakroom and large L shaped living/kitchen/dining room which is well equipped and has beautifully furnished in a contemporary style. On the first floor is a double bedroom with an en suite shower room, twin bedroom and family bathroom whilst, on the top floor, is a large master bedroom, also with en suite, and great views. Part of a Grade II listed conversion of a former hospital known as Blythview, guests staying at Serenity can enjoy the private grounds and benefit from the use of a communal indoor heated pool and mini fitness suite. There’s allocated parking for one car and a bistro style able and two chairs sit through double doors outside the dining area. The front door opens into a welcoming hallway with carpeted stairs to the first and second floors and access to the living space and cloakroom. A great place to relax with your friends and family, this double aspect L-shaped sunny room is has a comfortable sitting area to one side, dining space in the centre with table and chairs in front of the double doors opening to the communal gardens, and a smart modern and well-equipped kitchen incorporating a dishwasher, fridge, freezer, electric oven, gas hob and extractor hood over. Carpeted stairs lead to the first floor landing with the family bathroom, double and twin opening off. Overlooking the back of the house with panoramic views, this room’s furnished with a king size bed, bedside tables and a large built in wardrobe. Modern shower room with corner shower, WC, wash basin, heated towel rail and window. At the front of the house with twin beds, bedside tables and a built-in cupboard. This good sized bathroom has a bath with shower attachment, WC, wash basin, heated towel rail and window giving natural light. Carpeted stairs rise from the first floor landing to the door of the master suite. With great views to Blythburgh from the quaint window cove, this is a super light bedroom with king size bed, bedside units, a built in wardrobe with shelves and hanging space. 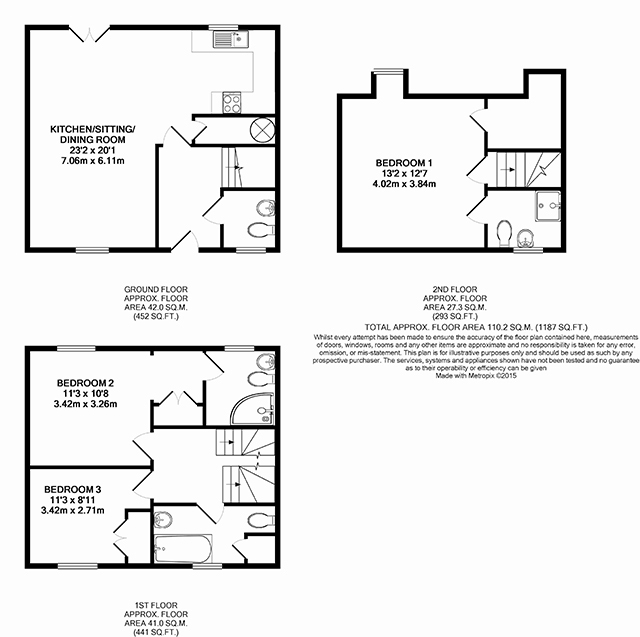 A stylish en suite with shower cubicle, wash basin, WC, heated towel rail and window. This terraced holiday house sits in 12 acres of land with well maintained communal gardens and allocated parking for one car with additional space nearby if you need more. There are double doors from the dining area opening to the grounds with a bistro style table and two chairs for your use next to the perimiter road on the estate. The Leisure Complex is a huge asset here, which includes a heated pool, mini fitness suite and a games room with table tennis and table football. This modern mid terraced self-catering holiday cottage is equipped with central heating and appliances include a TV with FreeSat, Wifi and ipod docking station. The kitchen is well equipped with a fridge. freezer, electric oven, gas hob with four rings and washing machine. A travel cot, high chair (no stairgate) are available from the property owners on request at the time of booking. Serenity occupies an excellent location for easy access to the many attractions of the East Suffolk Heritage Coast, which include many walks and cycling routes and for bird watchers there is the renowned RSPB sanctuary at Minsmere within easy driving distance. Within five miles is the renowned coastal town of Southwold, famous for its iconic pier, Georgian and Victorian architecture, individual shops and traditional pubs. The picturesque coastal village of Walberswick is also worth a visit with long stretches of sandy beaches, village green with gift shops and tea rooms and a couple of great pubs serving excellent food and local beers. A well-behaved dog is welcome downstairs. If you wish to bring a dog it must be mentioned at the time of booking on the booking form and is subject to our conditions of booking. Whilst the rear garden is enclosed you are advised to keep an eye on your four-legged friend and asked to clean up after it. The outside table and chairs is only suitable for two people and sits next to the perimiter road for the estate - not a busy road but not an idyllic rural spot either - more suited to a morning coffee or evening drink than dining!